What Is a Plaintiff in a Lawsuit? The plaintiff is the person bringing a lawsuit to court, by filing a plea or motion. More frequently these days, in civil law cases, a plaintiff is often called a claimant. That is, the plaintiff or claimant is the person bringing a claim against another person. The term claimant is also used in arbitration cases. The terms "plaintiff" and "defendant" go back to medieval times when English common law practices came into being. The term "plaintiff" comes from the Old English for "aggrieved" or "plainant" and it has the same root as "complaint." The other party in a lawsuit is the defendant or respondent (the one who responds). The defendant is the person being sued or the person against whom the complaint is filed. The plaintiff in a criminal case, in its broadest sense, is "society as a whole." The plaintiff isn't the victim. Depending on the crime, the government entity that has jurisdiction is considered the plaintiff. For example, kidnapping is a federal crime, so a federal prosecutor brings a case against the defendant and prosecutes it in federal court. Most business litigation deals with civil law; that is, one party bringing a lawsuit against another party (a plaintiff bringing a suit against a defendant). A "party" in these cases can be an individual or a business or an organization (like a non-profit organization). Civil law has mostly to do with the failure of one party to do something or avoid doing something that causes harm to another person. This concept is sometimes called specific performance. That is, the defendant has failed to perform a specific act. For example, if one party (the defendant) fails to pay money owed to another party (the plaintiff), the plaintiff must go to court to get that money back. To begin a lawsuit, the plaintiff must file a complaint and a summons in the appropriate court. These are two separate documents. The complaint sets up the reasons for the lawsuit by describing what the defendant did wrong (breach of contract, for example). The summons sets specific requirements for the other party to respond. Sometimes the response is in written form, while at other times the summons is to appear in court (in small claims court, for example). These documents, along with other documents setting out the plaintiff's case, are referred to as "pleadings." The lawsuit proceeds from these actions. 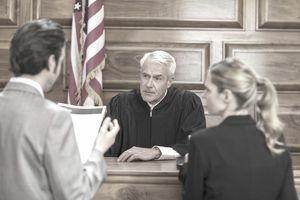 In both civil and criminal cases, the plaintiff has the burden of proof. The plaintiff is required to prove his or her case is true, against a standard. That makes sense because the plaintiff is the party bringing the suit to court, so he or she should have to prove why the suit should be heard and why his claim has validity. In civil cases, the burden of proof is called "preponderance of evidence." Unlike in criminal cases, where the burden of proof is "reasonable doubt," preponderance of evidence is less difficult to prove. This term refers to the weight of the evidence, not the amount. The evidence is weighed by a judge or jury and whichever side has the most convincing evidence, with the most likelihood of being true, is awarded the judgment. In most federal tax issues, the IRS is the plaintiff and the individual or business taxpayer is the defendant. But in the case of Tax Court, the individual taxpayer is the plaintiff and the IRS is the defendant. Common Misuse: The word "plaintive" is not the same word as "plaintiff," although they have the same root. Plaintive means sad or mournful, as in a plaintive melody.